Melva and Wayne Wood (316 Glen Avenue) had someone try to drill out their garage door lock the other night to try to break in. Households along the 300 and 400 block of Glen that have the alley run behind them should be on the look out and be sure to report any suspicious activity to the police. 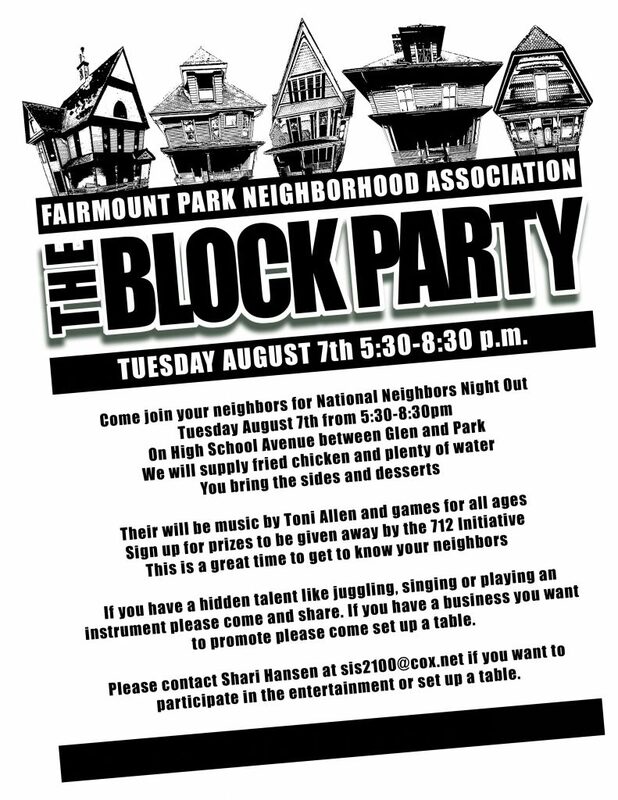 All Please enjoy the July edition of the Fairmount Park Neighborhood Newsletter. Another incident with the Adult Football League that plays up at Kirn Park on the weekends. After the football game on Saturday players from both teams got into a heated verbal altercation at the top of Glen and 5th Avenue. Neighbors had to call the C.B. Police as the rhetoric and threats started to escalate. The Police diffused the situation and broke up the gathering. It has been brought to the neighborhood’s attention that the Adult Football League that plays their games up at Kirn Park on Sunday’s is telling people they could not use the park without paying $5.00. The league was told specifically last year not to try that stunt again this year. C.B. Parks and Recreations has been called and they will be looking into the matter. If you go up to Kirn Park and anyone tries to charge you admission please politely refuse their erroneous offer. If they insist call the non-emergency number for the police to handle the matter. A neighborhood watch report from Steve Beck. I have not seen anything about this in our local newspapers or our local news stations. I live at 163 Glen Avenue. This is yet another incident right next door at 167 Glen. I woke up to a HUGE explosion, followed by several people yelling very loudly. When I looked out my window, there were 5 or 6 Sheriff’s department vehicles blocking off the road. There were at least 20 officers in fatigues and helmets, a few CSI officers, complete with a dog. They sent the dog inside. From what I could see, the officers brought out Danny Combs (the dad with a prosthetic leg), two of his sons, and 3 or 4 other characters I have never seen before, all of them in handcuffs. I expected ALL OF THEM to go to jail, and maybe this would finally be over. (I have put up with this for 5 years — recall the knife fight and attempted murder in 2016.) However, when I got home yesterday Danny was back home again, repairing the front door to close up his house. He’s out on his front porch again today, working on his woodworking creations yet again. I don’t know if he is out on bail or what. I’ve seen absolutely nothing on the local news channels, and today’s Sheriff’s report listed 3 incidents for yesterday, none about what appeared to be a drug bust next door. I have always suspected they were drug dealers, due to the constant traffic in and out of the house day and night (nobody has that many friends). I wish I could find more information on this. Anyone charged with anything? I just want these people to be gone. Feel free to distribute this to the neighborhood watch. Steve Beck, 163 Glen Ave.